One of the many benefits of growing your own food is that it teaches you many lessons. Some of the lessons that I have been reflecting on this week are patience, value, and responsibility. Food takes time to grow. This is a fact that is easy to forget in this day and age when a 5 minute trip to the grocery store instantly gives us access to food grown across the continent. Even with an aquaponics system speeding up growth, heads of lettuce or kale can still take 4 – 6 weeks before they are ready to harvest. Having this aquaponics system growing food has reminded me that food doesn’t grow instantly, and that I have to be patient with the process and wait to harvest the food. This also ties in with the value of our food; not only the nutritional value, but how we value our food. Food is important, clearly, as we need nutrition to live our lives, but some people are unable to get the basic nutrition they need. At the same time, large quantities (close to 50% according to a policy brief from the UN Food and Agriculture Organization, the Stockholm International Water Institute, and the International Water Management Institute) of the food produced worldwide is being thrown out. One of the main reasons for this food being wasted is because it doesn’t look perfect. People don’t value misshapen apples or carrots as much as their “normal” counterparts. I think people who grow their own food value food differently. It doesn’t really matter how it looks because you’re just as proud that with your help this life-giving food was grown, and you’re been patiently waiting for it to mature. Finally, it is quite something to be responsible for the lives of many living creatures. Sure, I have taken care of my dog Biscuit for years now, but she can tell me when something is wrong. Fish and plants are much more sensitive and less obvious about communicating their needs, but I am learning the signals they do give. The process of learning these signals has not been easy, and we have had fish die that we have been nurturing for weeks. With 11 days until our wedding, Anna and I aren’t yet thinking about having children, but I know this responsibility that I feel for the fish and plants in the aquaponics system is just a shadow of the responsibility of raising children. Like raising children, it can be worrisome to have such responsibility, but it can also be very rewarding to see them grow and mature. When Jake and I started building the aquaponics system several weeks ago, I thought I was going to learn about biology, business, and engineering. I have learned about those things, but I never imagined that it would teach me lessons about life as well. As we continue to work with aquaponics systems over the next months and years to come, Jake and I will not only continue to learn, but will strive to share these lessons with others, especially children. 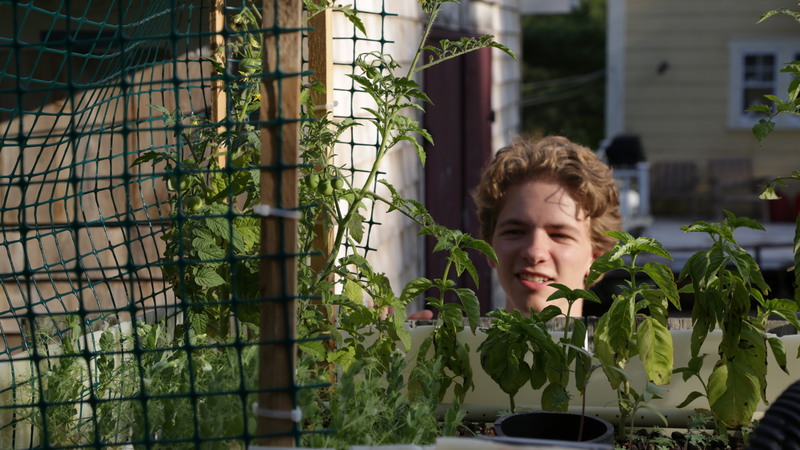 Andrew checking on the plants in the aquaponics system. Photo credit: Gracen Johnson. The pace is picking up at the Oasis Farmery as our days in the Summer Institute Foundry Program slowly check themselves off the calendar. Andrew and I are starting to gear up for our final cohort presentation on July 30 at the Cedar Tree Café, and the process of doing so is reaffirming the significant roles all the Foundry mentors and fellow entrepreneurs are playing in our development. Just today, Gracen made the bicycle trek, full camera gear in tow, from her place on the South side of Fredericton to the Oasis Farmery on the North side to shoot some photos for our final presentation. And earlier this week, Philip Leblanc took the time to put the final touches on our logo, ensuring every last curve, splatter, and colour coincided with our vision for the company. Without these people, and the many others Andrew’s mentioned in the past, this company wouldn’t look close to what we’re now so proud of. Propinquity to and cooperation with the right people has made us realize how important it is to bring on new teammates for the exciting year ahead. This week we sat down to speak with two potential candidates for the Oasis Farmery team and were blown away by the enthusiasm we saw for the Oasis Farmery model we’ve built. If those meetings are any reflection of the type of people the Oasis Farmery is going to attract as we continue to expand the team, expanding the impact of this company could happen much more rapidly than first anticipated… and we’re looking forward to it. If you’re interested in a night of great food, great people, and great ideas, get your name on the list for the final Foundry presentation at the end of the month where we will present our progress with the other great companies in our cohort. Follow this link to register: foundry2014.eventbrite.ca . After seven days without power, the aquaponics system turned on Friday evening without requiring the portable generator. This hurricane was quite the stress test for the system, but all of the fish survived and the plants are much happier now with a reliable source of water and nutrients. Even without power the tomato plants now have a handful of small green tomatoes where the flowers use to be, which will soon be ripe, red, and ready to eat. As the plants continue to grow, so do Jake and I. We have had the great opportunity to be one of the five companies in the Technology Management and Entrepreneurship’s (TME) Foundry program this summer. Foundry has allowed us to work with a cohort of young entrepreneurs, get expertise from a variety of mentors, and get the funding we need to get started. The companies in Foundry are all making a positive impact on people’s lives in very different ways. Kyle MacNevin and Kayley Reed have started a mental health conscious clothing line called Wear Your Label, Danny Nuguyen is providing Fredericton with delicious Vietnamese food at Beyond Saigon, Kati Waygood of Waygood Mobile Therapy is changing preventative health care, and Anna Haines of Ploome is enriching lives by teaching and selling fiber arts. Jake and I as the Oasis Farmery are part of this great group, and we all teach, support, and provide feedback to each other. But as young entrepreneurs we only know so much, so Foundry has provided us with mentors that are experts in their fields. These mentors include Rivers Corbett (Serial Entrepreneur, Relish Gourmet Burgers), Philip LeBlanc (Artist & Designer, Fredericton Makerspace), Johnny Leroux (Architect & Designer), Gracen Johnson (Media Relations & Videography), and Dhirendra Shukla (MSc in Chemical Engineering, MBA, PhD, & TME Director). Through this three month program, Foundry has propelled the Oasis Farmery towards being a successful business by providing us with a group of fellow entrepreneurs to lean on, mentors to guide us, and the money to grow. We’re very excited to announce a number of new members to the Oasis Farmery family. Wednesday night, a close friend of ours, Gracen Johnson, put on a great vermiculture workshop at the soon-to-be-open Fredericton Makerspace. For those unfamiliar, vemiculture (or vermicompost) is essentially composting with worms. It’s quick, it’s easy, and it produces exceptionally fertile soil for planting, so of course Andrew and I participated alongside all the other worm lovers. It’s safe to say we too are now converts to the worm-loving cult, and we’re pleased to share that we now have two living vermiculture systems running, both of which will eventually be used to support the growth of our plants. The workshop was an exceptionally exciting night for us, only made more enjoyable by watching all the children light up at the sight of worms and, of course, power tools. Andrew and I think power tools are great too but we’re a little more enthusiastic about finding ways to incorporate these two new working systems into the Oasis Farmery. The worm castings produced can be used on our plants, which mean healthier plants for us and better tasting ones for you! Another major development this week at Oasis Farmery is our shift towards manufacturing smaller, more manageable aquaponics systems for domestic use. These new miniature systems are some of the easiest and most efficient ways to grow home plants and produce, designed by Andrew so carefully that essentially no setup is required. Grab some fish, fish feed, seeds of your liking, plug in the system, and you’ll be growing aquaponically at home in a snap! If you’d like to know more about these limited stock models, email us at oasisfarmery@gmail.com. Use the promotional code: OASISBLOG in your email for $50 towards your home aquaponics system! We weathered hurricane Arthur, this hot Fredericton weather hasn’t slowed us down, and we’re about to release our new domestic aquaponics kit. The energy around the Oasis Farmery is infectious and we’re looking forward to some exciting developments in the weeks that lay ahead. Until next time, eat well and be happy! 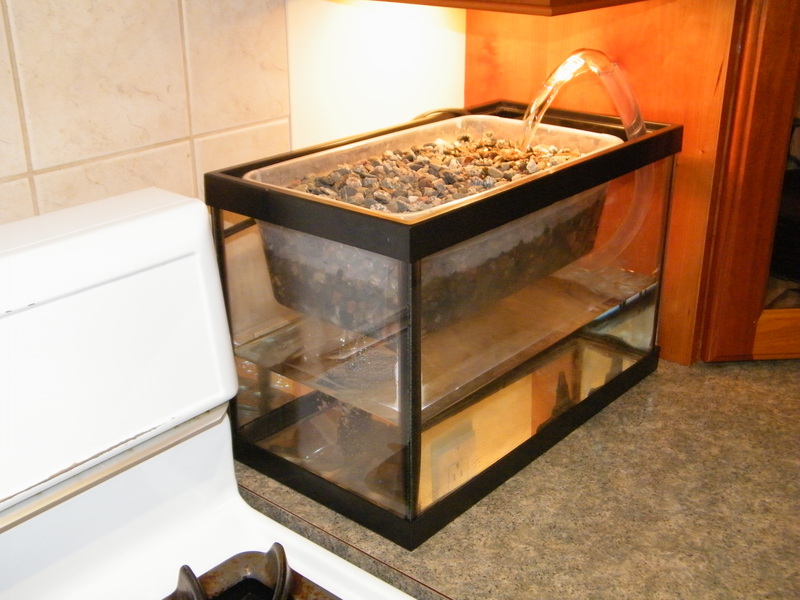 Beta model of the Home Aquaponics System, available for order now! Use the power of aquaponics to grow herbs and vegetables quickly in your own home, and have pet goldfish at the same time. After winds up to 70 km/h and 2000 trees down, 87 000 customers across the province are without power, including the mini farm where the Oasis Farmery is located. Once I realized Saturday morning that the power at Anna’s was out, I rushed to her house to check on the aquaponics system. To those new to the Oasis Farmery community, Anna is my fiancée, and her mother Pam has allowed us to set up the aquaponics system at her house/mini farm. The whole family: Pam, Anna, and Olivia, Anna’s younger sister, take care of the animals on the farm, including a pug named Gracie, a cat named Daisy, 11 chickens and a budgie. The problem was that the fish can’t live long without the electric pump running to circulate the water and provide oxygen to the fish. Luckily, Pam’s father was already at Anna’s setting up a generator to run the sump pumps for the house, and we were able to use the power as well. 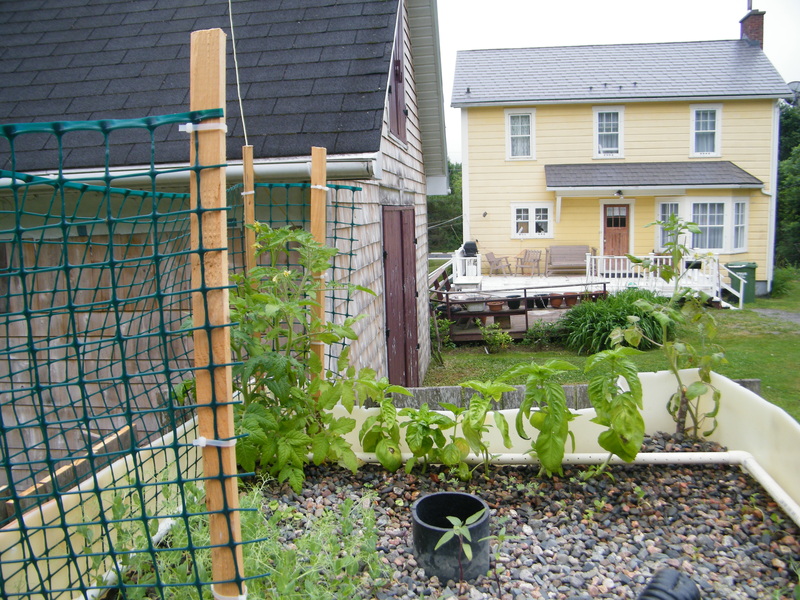 The recently installed fence on our first aquaponics system was able to withstand the winds, along with our taller tomato and basil plants. The rest of the plants; pea sprouts, sunflowers, kale, and cilantro were all short enough that the edge of the IBC protected them. 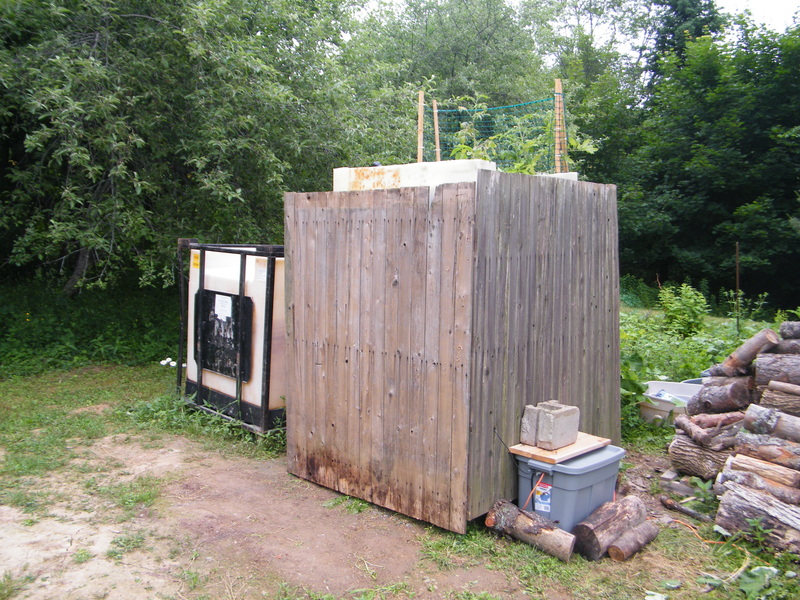 Also, the electronics box, containing the credit card sized computer that runs the system, was able to withstand the weather after being held in place by a cinderblock and a few logs, so everything inside stayed nice and dry. Hurricane Arthur has taught us that the fish can actually go for longer than we expected without the pump running, which is great since the power isn’t expected to come back on for the next couple days. 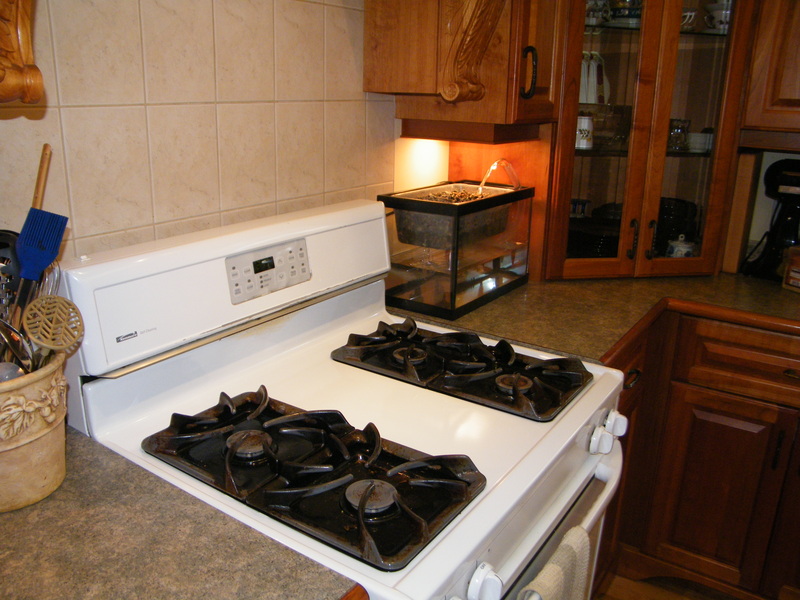 Until then we’re running on generator power and starting to consider a solar backup system. Arthur gave us quite the scare but we survived and are on with a full head of steam! Our newly fenced aquaponics system, with the electronics box in the lower right and a raw IBC on the left. Our garden bed with Pam’s house and barn in the background.